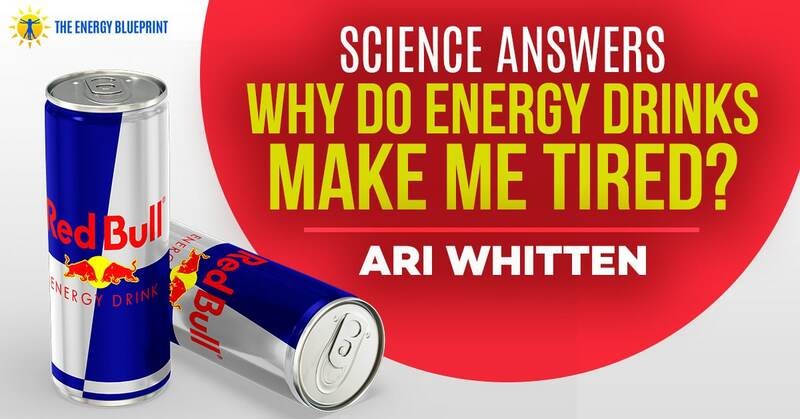 Science Answers, Why Do Energy Drinks Make Me Tired? Have you ever asked yourself the question, why do energy drinks make me tired? 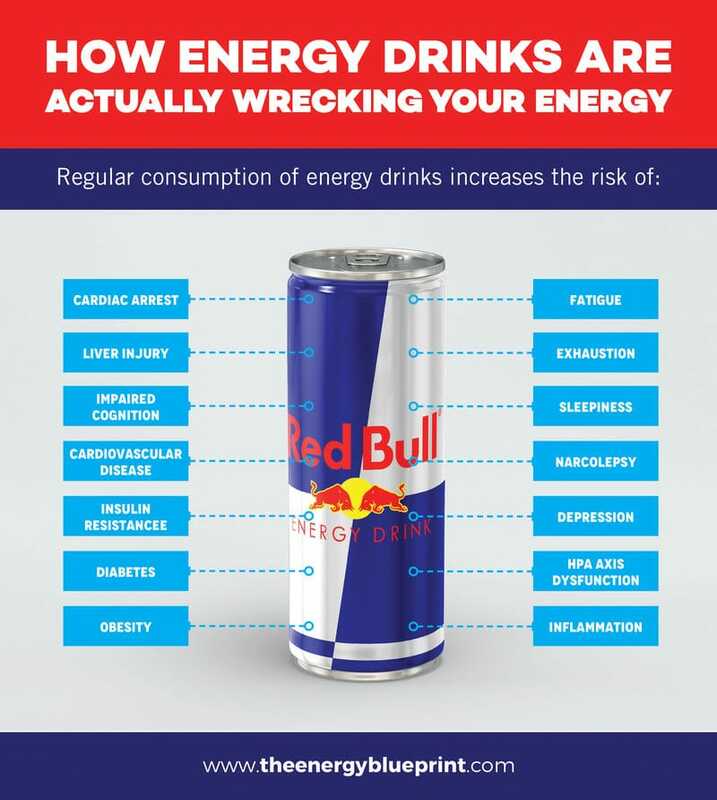 Energy drinks are supposed to be giving you energy and granted, they will give you an initial boost of energy, but are the effects of energy drinks on the body actually destroying your mental and physical energy levels? The science says, “Most definitely, YES.” Fatigue is one of the long-term side effects of energy drinks. Let’s first get something out of the way: Energy drinks actually do give you an initial boost of energy. They do work. So I do not intend to debate that fact. Rather, I am going to show you that while “energy drinks” are energizing initially, energy drinks will actually make you more tired when you consume them regularly. The reasons why are a little complex, so bear with me and I will explain how all this works. The caffeine in energy drinks provides an initial boost of energy, but regular caffeine consumption actually creates negative neurotransmitter adaptations in the brain, eventually making you fatigued instead of energized. Their high content of refined sugar negatively impacts orexin, a neurotransmitter that creates our wakefulness and energy levels. Refined sugar also leads to nutrient depletion of other important cofactors for producing energy. Consuming calories (especially sugar) without fiber leads to negative changes in the gut, which can contribute to fatigue. Refined sugar also promotes inflammation and oxidative stress in the body, which also suppresses orexin and damages mitochondria. Let us look at the research and talk about how to re-establish a higher baseline energy for you, so you can attain new heights of energy again. Each energy drink you consume contains about 29 grams of sugar, which equals about 7 teaspoons of sugar in every single can. Some energy drinks have double that content for sugar. In fact, the hugely popular Monster energy drinks contain a whopping 59 grams of sugar (13.5 teaspoons of sugar)! Now, let us talk about the four ways sugar causes fatigue. 1. Why Do Energy Drinks Make Me Tired? – Sugar lowers orexin, which makes you sleepy. We all want to feel this way, of course. When we feel really energized, we experience more motivation to do everything and to do everything better . . . to become the go-getter at work with all the accolades, promotions, and more money, to reach the top of your class at school, and even simple everyday stuff like making the best meals for your family, keep a cleaner house, exercise more, play more—just do more, period. In short, we all want to liberate orexin, not suppress it. But if you are drinking energy drinks regularly, your orexin is being suppressed all the time, and there is less orexin in the body to produce that feeling of high energy. High orexin levels = energy, wakefulness, not sleepy at all. Creating rapid surges in blood sugar (like with refined sugar consumption) has been shown to reduce levels of orexin in the brain, so consuming 7 teaspoons of sugar will definitely cause a drastic drop in orexin levels. Studies show that these large amounts of sugar in the bloodstream are enough to suppress the activity of orexin neurons in the brain. If orexin activity is suppressed to this extent, we will feel wiped out, physically and mentally exhausted, and drained of energy. If we keep suppressing orexin by drinking lots of energy drinks, depletion of this neurotransmitter will occur in all our systems of the body to the point that we can experience chronic fatigue. Now, there is an interesting nuance to this story, because sugar also gives us an initial hit of dopamine. And dopamine actually promotes orexin release and gives us pleasure. That is the main reason why they put sugar in these drinks – because it gives us pleasure and is habit-forming, so we want to come back again and buy more of their product. This initial hit of dopamine can be energizing and pleasurable and put you in a good mood initially. We all know how good it feels in that moment to take a bite of cake, or ice cream or chocolate. But this initial surge of pleasure and wakefulness ultimately gives way to the orexin-suppressing effects of sugar. In short, sugar prevents orexin activity, so we become tired rather than energized after eating it, especially when we consume a lot of it. 2. Why Do Energy Drinks Make Me Tired? – Refined sugar causes inflammation and damages mitochondria. Even more importantly, refined sugar damages our mitochondria. Why is that important? Simple: Mitochondria are the energy generators in our cells. So by doing things which promote chronic inflammation in your body, you are literally damaging the parts of your cells that actually make your energy at the cellular level. And a body full of cells that do not produce energy well means that you will not produce energy well. In short, if you consume foods and drinks rich in refined sugar regularly, you’re headed towards mitochondrial dysfunction and fatigue. This is because sugar actually depletes nutrient stores in our tissues, depletes nutrients in other foods we eat and increases nutritional requirements all at the same time. Think about that – sugar itself is a nutrient and a source of calories. But by providing your body with the nutrient of sugar in the form of refined sugar, you will actually deplete your body’s stores of other nutrients. ATP is what we need to fuel our bodies with energy, but when we pour refined sugar into our body frequently, we exhaust our bodies, depleting our energy-yielding B vitamins and depleting ATP as well at the same time. ATP is literally your cellular energy. That’s what your mitochondria are pumping out on the cellular level to give your cells energy. And the ability of your cells to produce energy is ultimately what gives YOU energy. So low ATP in the cells means that YOU will feel fatigued. New research has shown that consumption of refined sugar and sugar-sweetened beverages (like “energy drinks”) is linked with gut dysbiosis (that means having too many bad bacteria) and leaky gut. In addition, gut bacteria feed on fibers in the diet. So when you regularly consume calories in refined foods that carry no nutrients for good bacteria to feed on, those bacteria can actually start to eat away at your intestinal lining to get their food. So not only does this lead to having more toxin-producing bad bacteria in your gut, but because of the gut leakiness, more of that toxin will leak into your bloodstream. Several studies have now shown that chronic fatigue is linked with gut permeability (a.k.a. leaky gut). And studies have even shown that correcting the leaky gut can lead to huge improvements in fatigue symptoms (even in some cases, complete remission of chronic fatigue syndrome). If you want to avoid fatigue (or overcome fatigue and get your energy back), healing the gut and keeping it healthy is a huge piece of the puzzle. I have spent a lot of time talking about the fatigue-creating effects from refined sugar consumption, but there is another huge factor that causes fatigue in “energy drinks” that I have not even mentioned yet: caffeine. That might seem like a counterintuitive statement since of course, we all know that caffeine gives us more energy – it does not make us fatigued. Yes, it is true that caffeine gives you energy after you take it. In fact, there are literally hundreds of studies on caffeine showing benefits to wakefulness, energy levels, and physical and mental performance. Confused? Wondering how the heck we can reconcile the fact that lots of studies show that caffeine gives us an energy boost with the concept that it makes you fatigued? So here is the deal: Just like with sugar, there is a big difference between short-term and long-term effects. (I go in-depth on the research on the subject of how caffeine makes you fatigued in this video, but below I’ll give a quick overview). See, daily caffeine consumption actually does something really insidious – in the process of making you think it is giving you energy, it is actually wrecking your energy! To understand how caffeine affects the brain in the long term and how it comes to wreck your energy levels, you need to gain a deeper understanding of what caffeine does to our “sleepy” neurotransmitter adenosine and the adenosine receptors in the brain. Adenosine is a neurotransmitter in the brain that is an “inhibitory” neurotransmitter. That means it is a sleepy and relaxy sort of neurotransmitter. And we have lots of adenosine receptors in the brain. So when adenosine binds to adenosine receptors, it creates the feeling in you of being tired and fatigued. The more adenosine builds up, the more adenosine receptors it binds to, and the more fatigued and tired you feel. So how does caffeine figure into this situation? Simple: Caffeine works by blocking adenosine receptors. It literally binds to the same receptors as adenosine does and plugs them up so adenosine cannot get in. Since adenosine cannot get into our adenosine receptors, it cannot tell the brain that “you are getting very sleepy,” as a hypnotist might. By blocking adenosine from getting in, it is blocking the thing that would normally make you feel more tired and fatigued. By blocking the fatiguing substance, it creates a stimulant effect that energizes you. So that is how caffeine works. Now all of that actually sounds pretty good so far. I mean, who does not want to feel more energy, be in a better mood, and perform better physically and mentally. Here is the problem: These effects only work this way for people new to caffeine consumption. With chronic caffeine consumption, you not only don’t get these effects, but you actually worsen your energy levels and performance! Your body does not want you to do things to it that disrupt its natural balance. The best example of this is how the body eventually reacts if you keep losing weight. It fights against you by slowing your metabolism and making you lethargic (so you burn fewer calories) making you really hungry (and everyone knows how miserable it is to suffer through hunger pangs for days and weeks on end). Your brain also has a natural balance point – it likes to maintain a certain balance of stimulatory neurotransmitters vs. relaxing neurotransmitters (like adenosine). That way you are not too wired or too tired all the time. This balance is critical for our ability function and survive, and for how energetic we feel. So when you block adenosine from getting into the brain, you get a stimulating and energizing effect. But you have also disrupted the brain’s preferred balance of neurochemistry. The brain senses it is being overstimulated and begins to fight back! It fights back against this loss of adenosine in two fatigue-creating ways. When the caffeine effect wears off many hours later, the adenosine comes back with vengeance and you will experience even more tiredness. When you consume lots of caffeine every day, your brain senses that it’s being chronically overstimulated and that it’s experiencing a consistent shortage of adenosine in the brain, so it fights back by increasing both its production of adenosine and the number of adenosine receptors in the brain. What does that do? It makes it so even with caffeine in your system, your body is still getting adenosine in there so you don’t get stimulated very much. But even more importantly than that, when you don’t have caffeine in your system, you now have much more adenosine signaling going on all the time – so you’ve actually changed your baseline energy levels to be lower all the time. In other words, chronic caffeine consumption actually creates negative neurotransmitter effects in the brain that actually lower your energy, mood, and performance all the time you’re not on caffeine! And here’s the key part to understand: While caffeine consumers do still feel a boost after they consume it, what they don’t realize is that they’re just getting a boost back up to what used to be their normal level of function. They’re going from impaired to normal – not from normal to better than normal. So really what they’ve done is create a situation where they are now depending on a drug just to function normally, and unless they have that drug, their brain is actually impaired. And of course, their mood, performance, and energy all suffer as a result. The question is, why repeatedly consume beverages that are lowering your capability for energy and happiness in your system? Just as alcoholics keep drinking until alcohol is no longer a “fun” experience and it no longer even feels good anymore, our body will fight us on overconsumption of most things. And with sugar and caffeine, it’s easy to overconsume them and create harmful effects on your health and energy. Dependence on caffeine, just like dependency on alcohol, increases your tolerance for caffeine and increases your need for it as well. Pretty soon, you have to have it to function and you literally walk in a stumbling daze toward the coffee pot in quest for more (or to the fridge for more Red Bulls). Energy drinks may seem like a quick fix solution to more energy, they’re actually insidiously wrecking your energy, making you more tired in the long run without you realizing it’s happening. Even though you think that energy drinks are giving you a great boost in energy, if you consume them regularly, what you do not realize is that you are mostly just getting a boost back up to what used to be your normal level of energy and performance. While you might think energy drinks are allowing you to ascend to new levels of energy, you are not only exhausting your energy stores, you’re setting the “bar” lower and lower for how much energy you are really capable of. Hopefully, I have now given you some powerful motivation to take a break from energy drinks and other caffeinated beverages so that you can “reset” our energy levels and break through that lowered “ceiling” you have created, recapturing that energy you had in your youth. Do not make the mistake of becoming a chronic caffeine addict trying to power your way through exhausting days of work, kids, workouts, or play through your caffeine habit. That approach may feel like it is working, but it is actually slowly sabotaging your health and energy levels. If you want to have great energy levels, the solution is to build a foundation of great cellular, hormonal, and mitochondrial health — not to rely on quick-fix solutions that wreck you over time. 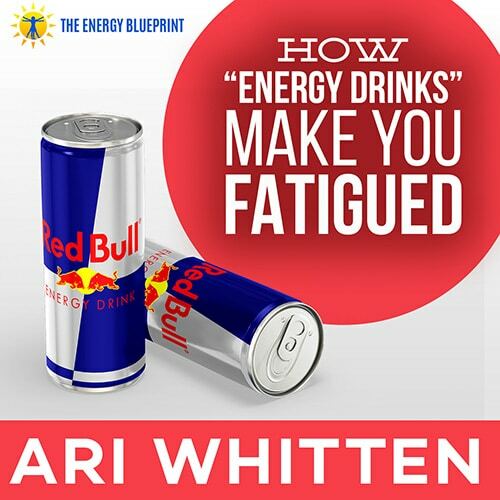 I am really enjoying these podcasts, and this one on energy drinks answers many questions for me. I’ve never really enjoyed drinking any kind of sweet drinks, for some reason, but I do drink and have always consumed a lot of coffee. Now I understand very well how to use this beverage and how not to use it. I purchase organic coffee, and have discovered a difference when I stop drinking it for a few days, and that was because the organic coffee didn’t have the toxins that the other coffees contain, but now I need to get my mind and body around giving up this really pleasurable beverage for days at a time, to fully appreciate and benefit from the good aspects, and to not diminish my body’s capacity to function fully all the time. I appreciate the information Ari is providing, on how to get the most from our innate ability to function optimally, by respecting what we need and to not abuse ourselves. Getting more done in less time, and burning the candle at both ends (as we used to call it) does eventually diminish our capacity to function. In my case, I became sick, because I would stay up late, get up early, and just try to function on about 5 hours of sleep. Mind you, I did accomplish quite a lot by doing that, but the law of diminishing returns does eventually kick in, and although I had accomplished quite a lot, I had to stop everything, and change all my habits to become a healthy person. What it did, however, was to teach me those aspects of being healthy that I now teach others. I am so happy that you are enjoying the podcasts. There are many more amazing ones to come. I am so happy to hear that you are experiencing this progress! Excellent information. Thank you for researching and sharing. Well presented. Learning about Orexin was helpful. Much appreciated! I am happy that you benefitted from it! One question: does honey (real) and molasses have same effect like sugar? Honey is a much better choice than sugar since it contains enzymes and micro nutrients while sugar is just empty calories (and will have a netto value for micronutrients in minus). So as long as used in moderate amounts it’s a much better sweetener than sugar. Molasses also has a lot more micronutrients than refined sugar and is a better choice than sugar. Do you have any research especially in regards to breastfeeding mothers? Thanks for this article. Is de-caff coffee ok? I reduced intake of my favorite beverage, regular coffee, to 15 oz daily. I wonder if even 1-2 cups coffee causes such havoc on mitochondria. If so, is decaf coffee an acceptable replacement? I have found Yuban decaf to be a tasty substitute. Your comments would be greatly appreciated. Excellent post. I was checking constantly this blog and I’m impressed! Very helpful info specifically the last part. I care for such information a lot. I was looking for this particular info for a very long time. Wow, this explains a lot. I have drank energy drinks literally everyday for a couple of years now. I feel addicted for sure. It’s a habit. I used to have 3 big cans of Monster everyday but cut it down, now it’s 2 or 3 cans of small red bull. I am so tired all the time it’s unbelievable. I wake up from a good sleep, I’m tired. I work, get home and I need a nap. I am chronically tired! Dr suggested it is most likely my diet and energy drink consumption. I am glad to see some science behind it. I had an echo done on my heart and all was normal, but I am super tired. I will stop drinking them from now on, but is there anything you recommend to help with the withdrawal? I’ll try juice perhaps. I was tired today after work, so I tried one of those monster drinks to actually see if they worked to get me motivated. Nope. Was asleep less than an hour later. Just like I thought. Worthless. Its all a gimmick as I tried the Red Bull before as well. Same thing. if you want to sleep like a baby, drink one of those!!! You would get a far better picker upper drinking a black coffee than consuming these over priced drinks – at least a coffee keeps you awake and you dont need to add sugar either. People who drink these for energy must like sleeping a lot because they do nothing for energy or alertness, at least not for me. This makes so much sense now. I can literally drink a Rockstar and go back to sleep. The other night as an experiment I drank one before bed and had no problem going to sleep. I have been drinking Mountain Dew and energy drinks for nearly 20 years, how do I fix what this has done to my body? OK, cool. How do we do that? By using your products only? How about food? There are numerous facets to natural energy enhancement and building greater energy production at the cellular level. Yes, nutrition is certainly one important aspect of that. No, I don’t force people to buy my products or imply that they must use my products to do that. I have numerous articles with free content online as well as a podcast with over 60 episodes with top doctors, health experts, and researchers. All of that is material that costs me tens of thousands of dollars to produce and I give it away for free.